Given the dramatic changes that have recently occurred in the economy, the topic of capital structure and corporate financing decisions is critically important. The fact is that firms need to constantly revisit their portfolio of debt, equity, and hybrid securities to finance assets, operations, and future growth. Capital Structure and Corporate Financing Decisions provides an in-depth examination of critical capital structure topics, including discussions of basic capital structure components, key theories and practices, and practical application in an increasingly complex corporate world. Throughout, the book emphasizes how a sound capital structure simultaneously minimizes the firm's cost of capital and maximizes the value to shareholders. This valuable resource takes a practical approach to capital structure by discussing why various theories make sense and how firms use them to solve problems and create wealth. In the wake of the recent financial crisis, the insights found here are essential to excelling in today's volatile business environment. 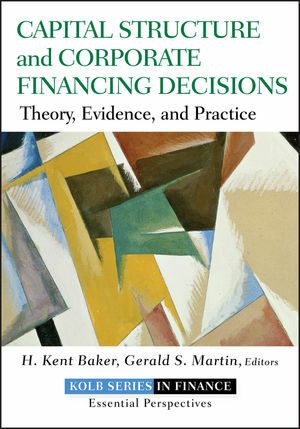 H. KENT BAKER, PhD, CFA, CMA, is University Professor of Finance and Kogod Research Professor at the Kogod School of Business at American University, Washington, D.C. He has published extensively in leading academic and professional finance journals including the Journal of Finance, Journal of Financial and Quantitative Analysis, Financial Management, Financial Analysts Journal, and Journal of Portfolio Management. Recognized as one of the most prolific authors in finance during the past fifty years, Professor Baker has consulting and training experience with more than 100 organizations and has been listed in fifteen biographies. GERALD S. MARTIN, PhD, is an Associate Professor of Finance at the Kogod School of Business at American University, Washington, D.C. He has published in top scholarly journals, including the Journal of Financial Economics and Journal of Financial and Quantitative Analysis. Before embarking on his academic career, Professor Martin spent seventeen years in the private sector as president and CEO of TMI Aircraft Finance/TMI Leasing, LLC, financing aircraft and aviation products worldwide for Textron Financial Corporation, as well as in marketing and research at Bell Helicopter Textron Inc.